The Amazon Rainforest. Simply hearing the term evokes all the wonders and mysteries of South America. Its extraordinary complexity makes it, still today, one of the most important ecological reserves in the world. However, deforestation for the benefit of soya and eucalyptus, intensive livestock rearing, the construction of dams and the pollution caused by digging for gold and other minerals threaten, now more than ever, the fragile balance of this priceless global treasure. Today, courageous Chief Raoni, we pay tribute to you. But let’s first retrace your incredible journey. You were born in the early 1930’s in a village known today as Kapôt, at the heart of the Mato Grosso in Brazil, and your childhood was defined by the constant travelling of your nomadic tribe, the Kapayos. A fervent believer in tradition, at age 15 you started wearing the labret on your lower lip, a mark of recognition for all warriors ready to die for their land. During the 1950’s, you acknowledged the existence of the outer world. Specifically, in 1954, with the help of the famous indigenous anthropologists, the Villas Boas brothers, you learned Portuguese and gained knowledge of the Kuben, the white people from the outside. These people never cared enough for the century old traditions and customs of the endangered Amazonian people. But your perseverance and your pride contributed to revealing the importance of this to the whole world. As a person of extraordinary integrity, you met the top leaders of the world as you were, and you never forgot who you were. After each mission, you returned among your people and went on living in a simple hut. You presented yourself to those leaders as the man you still are: humble and poor. Brazil President Kubitschek and King Leopold III of Belgium, French president Francois Metterrand and Pope John-Paul II are among those you sat with to promote your commitment to the fight for the preservation of the land of your forefathers. During the 1970’s you rose up against the construction of the Trans-Amazonian Highway, which cut its way through indigenous territories at the heart of the forest and which lead to conflicts and discord in your homeland, the Xingu. Unsurprisingly, your opposition to the construction of dams threatening indigenous people and the Amazon forest remained strong. Brazil officially recognized the importance of your message, and you became the most famous native Indian representative of the continent-country. Discerning and lucid, you quickly discovered the power held by the media and the help they could provide by broadcasting your message about the fears of your people falling victims to the systematic destruction of the forest. 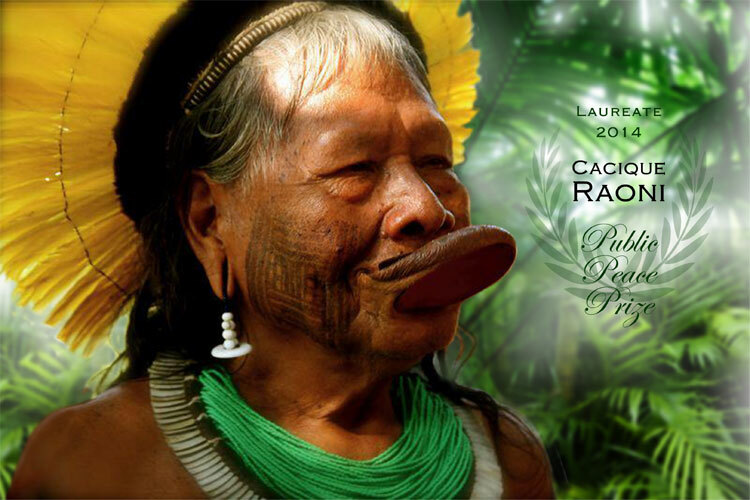 Chief Raoni, your influence transcends the cause of the Amazonian Rainforest. You are the symbol of the fight for the protection of age-old nations living as one with nature. You fight for life. You may worry about the apparent loss of interest of the younger generations toward your fight, but we still all hear your message loud and clear. Raoni, you are the founding father of the movement for the preservation of the last tropical rainforests, an invaluable inheritance for all of mankind. You are an inspiring Chief for your people and for all friends of Nature. To save this precious treasure of nature, you have often risked your life. We honour you for your great dedication. Thank you… merci… nambikwa… meikumbre.